What Replaces the "Free Market" in an Egalitarian Sharing Economy? The egalitarian sharing economy as described in Thinking about Revolution and here is based on sharing, according to need, among those who contribute to the economy reasonably according to ability. Critics of this kind of economy argue that it is either a Soviet-style centrally planned economy or, at any rate, it suffers from the same fatal faults as a centrally planned economy. They assert that when it comes to making an economy work properly, nothing can replace the discipline imposed by the free market in a capitalist economy. Defenders of capitalism argue that the only way to ensure that the economic activity of people actually provides the products and services that consumers want, in an efficient manner, is by allowing the free market to guide economic decision-making by disciplining businesses with the threat that if they don't provide what customers want, at a price customers are willing to pay, efficiently enough to make a profit while doing this, then they will go out of business. The beauty of discipline imposed by the free market, in this view, is that it requires no central planning board to determine if a business is providing what customers actually want, or if it is doing it efficiently enough to be permitted to operate. The problem with a centrally planned economy, according to this view, is that it is impossible for any central body to possess all of the vast information required to make all of the zillions of decisions that must be made in operating the economy of a nation rationally. This criticism of centrally planned economies is perfectly valid. The question then is whether there is a way for an economy based on sharing and equality (no rich and no poor) that is neither centrally planned nor disciplined by a capitalist free market to "deliver the goods." What follows is an argument for the "Yes" answer to this question. One of the most important ways for local assemblies to cooperate with each other is to mutually agree to form a single sharing economy. In a sharing economy, there is no money; one is either a member of the sharing economy or not. If one is a member of the sharing economy then one enjoys the right, equal to all other members, to take (for free--there is no money) products and services that one reasonably needs or desires, or--in the case of things that are in short supply--to have a chance, equal to others with a similar need, to obtain these by an equitable rationing method determined by the local assembly. If one is not a member of the sharing economy, then one may barter or else is essentially a beggar. The ultimate authority that determines if one is or is not a member of the sharing economy is the local assembly for the community in which one resides. The local assembly may, if it wishes, allow somebody to be a member of the sharing economy for any reason it wishes, but it also has the right to deny memberhsip to a person who does not contribute to the economy reasonably according to ability, as judged by the local assembly. Obviously, what constitutes a reasonable contribution according to ability would take into account a person's age and health and everything else that reasonable people would consider relevant. Now we can address the question of what, in a sharing economy, takes the place of the free market in a capitalist economy. What, in other words, ensures that economically sensible activity is promoted and economically non-sensical activity is discouraged? In a free market capitalist economy it is profitability (or the lack thereof) that supposedly does this job. It does indeed discipline people in the economy, and it does indeed drive some businesses out of business that, from a reasonable point of view, ought to be driven out of business. But a business can be profitable by catering to the very rich, thus directing economic resources towards producing things or services (e.g., psychiatry for a rich person's pet dog, a twenty-million dollar mansion for one small family) that are not terribly important at the cost of depriving others of things that are (e.g., health care, housing.) Profit is the reason why landowners don't grow food for people too poor to buy it, and instead grow crops that get made into luxury items that wealthy people can afford to buy. This is one reason capitalism is not good. In particular, this shows that in looking for something to replace profitability in a free market we are looking to replace something that is far from perfect to begin with. It is not necessary, therefore, for the replacement to be perfect, just better, as judged by criteria we think are important. What are these important criteria? The following seem reasonable objectives for whatever replaces profitablity in a free market: 1) Promote economic activity that provides for the needs and desires of people living as equals in an egalitarian society. 2) Motivate people to contribute reasonably to the economy according to ability. 3) Promote efficient (with respect to the previous criteria) use of human and material resources. The sensible replacement for profitability in a free market capitalist economy is reputation (with respect to the above criteria, as described below) in a sharing economy. Here is how reputation plays this key role. A local assembly, call it Assembly A, has the option of saying, "We won't agree to our community being in a sharing economy that includes local community X." If X has a reputation for admitting lots of people into the sharing economy who don't actually contribute and share reasonably according to ability in the opinion of Assembly A, or if, in Assembly A's opinion, local community X contributes things that are unreasonably useless (or of inferior quality or of insufficient quantity or not delivered reasonably, etc. etc.) compared to things that they could otherwise contribute, then Assembly A may exercise this option. If other local assemblies also share Assembly A's opinion, then Assembly X, if it wishes to remain in and enjoy the great benefits of membership in a larger sharing economy, will have a strong motivation for making changes to ensure that it has a good reputation. Having a good reputation (for contributing to the economy reasonably and efficiently) plays a role in a sharing econony analogous to having a high rate of profit in a capitalist economy. A decline in reputation /profit leads eventually to exclusion from the sharing economy / bankruptcy. Like profitability in a capitalist economy, reputation in a sharing economy operates at all scales, from that of a hot dog vendor on the sidewalk to a multi-national corporation. Here is why. A local community assembly would typically oversee a committee it appoints to decide if economic enterprises in the community should be members of the shasring economy. The decision would be about the enterprise as a single entity, not about each individual worker in it. And the decision would be based on the overall reputation of the enterprise. A hospital, for example, would be judged on the basis of its overall reputation, not a close inspection of every person who works in it, much as today when a sick person decides on what hospital to use he or she goes by overall reputation of the hospital, which might include things such as whether the hospital is certified by the appropriate organization, etc. In order to maintain its good reputation, a hospital (to take that as an example, but we could be talking about any other economic enterprise), would in turn want to ensure that its component entities (the emergency room, the intensive care unit, etc.) have good reputations. The hospital (meaning the hospital workers, acting democratically as equals, in a "hospital assembly", or more generally a "workplace assembly") decides who can be a worker at the hopsital. If the hospital is a member of the sharing economy, then so are all of its workers. If, however, a section within the hospital, say the ER, has a sufficiently bad reputation, then the hospital would be motivated to dismiss the workers who are responsible for the bad reputation, in order to maintain the reputation of the hospital and its membership in the sharing economy. Thus the role of reputation extends downward from the level of the local community assembly to the economic enterprises within the community and even to the individual workers in those enterprises. In a community there may be economic enterprises of varying sizes, from a one-person hot dog vendor on the sidewalk to a large hospital or local branch of a multinational organization. In the case of hot dog vendors, it would be likely that all of them would join an association of hot dog vendors (or something similar) and this association would, as a single entity, seek membership in the sharing economy based on its reputation; it would also be concerned with the reputation of individual hot dog vendors for the same reason as discussed above in the case of a hospital. As discussed above in the case of a local assembly not agreeing to remain in a sharing economy that included local assembly X with a bad reputation, local assemblies have the option of not agreeing to remain in a sharing economy that includes a multi-national organization whose reputation they don't like. If only local assembly A objects to multi-national organization X then A's choice, in practice, is to leave the sharing economy or remain in it with X. But if lots of local assemblies object to X, then one or more relatively high level assemblies could threaten to leave the larger sharing economy and establish a smaller one of their own unless X was denied membership in the larger sharing economy. To avoid this, X would of course be motivated to ensure that it has a good reputation among as many local assemblies as possible; otherwise it would risk exclusion from a large sharing economy--the equivalent of going out of business in a capitalist economy. Reputation thus plays an extremely important role in the sharing economy, a role similar to that played by profitability in a capitalist economy. Reputation in a sharing economy would be so important that some economic enterprises in a sharing economy would specialize in performing the function of deciding whether or not to grant their version of the "Goodhousekeeping Seal of Approval" or their version of what is today called "certification" for colleges, etc. Others might be more like newspapers that investigate wrongdoing (and excellence as well) and report it. It is impossible to anticipate all of the creative ways that reputations might be established for various kinds of economic enterprises. Who, for example, could have anticipated a few decades ago Facebook's "like" system? But one way or another, in a society in which reputation plays such an important role, ways will be invented for establishing reputations sensibly. The striking advantage of reputation driving economic decision making in a sharing economy, in contrast to profit in a capitalist one, is that reputation is based on the most important criteria, whereas profit is not. Ony when reputation, and not profit, drives decision-making is it possible for a local community assembly to make reasonableness prevail over unreasonableness, by, for example, denying membership in the sharing economy to a person or enterprise whose "contribution" is providing psychiatry for pet dogs, or constructing twenty-million dollar mansions for small families when this is at the expense of some people having far more important things, such as good health care or shelter. But how would economic decisions actually be made based on reputation? How is it possible, practically speaking? Letting individual consumers make decisions by choosing how to spend their money has resulted in the remarkable entrepreneurship, creativity and productivity that capitalism claims for itself and for itself alone. Because the only sustained (at least more than a few years) modern challenge to free market capitalism--Soviet style central planning--has clearly failed, capitalism claims that, as Margaret Thatcher famously put it, There Is No Alternative. Doesn't decision-making by reputation instead of profit entail the same problems that make a centrally planned economy fail? Doesn't a reputation-based sharing econony suffer from the same two defects as a centrally planned economy: a) stifling entrepreneurship creativity and b) failing to make use of information scattered among huge numbers of people, information that is incorporated in the price of things in the market place? How is a reputation-based sharing economy, with respect to these key questions, any different from a centrally planned economy? In the sharing economy, a person or group of people with an entrepreneurial idea can "pitch" their idea as a proposal to the local community assembly, say Assembly A. If the proposal is approved as the basis for membership in the sharing economy of the enterprise and its workers, then the enterprise can take (for free) from the sharing economy everything it needs, and the workers, as members of the sharing economy, can take everything they reasonably need or wish, as described above. Of course Assembly A's decision to approve or not would take into account the availability of relevant raw materials and manufactured items. If these things must come from other communities, then Assemby A would need to determine that their reputation will not be adversely affected by taking these things for the entrepreneur's project. To do this they might simply use their knowledge about how other people felt. But this runs the risk that they approve a project only to discover that other local assemblies object to it, adversely affecting Assembly A's reputation. Instead, Assembly A might have their delegate to the appropriate "higher level" assemby introduce a proposal for sharing the things that the entrepreneur's project requires. This proposal would go through the process of being amended by other delegates; then, in the course of seeing if the local assemblies agreed, there might be suggested amendments from them, and back and forth negotiations until there was a proposal that sufficient assemblies agreed with to make the entrepreneur's project possible. Before objecting that this process for an entrepreneur to get the green light to start his/her new enterprise is too restrictive or cumbersome, compare it to what a would-be entrepreneur must do in our current capitalist society. Unless a would-be entrepreneur is very wealthy, he or she needs to get wealthy people to loan or invest the big bucks required to start the new enterprise. This means going to venture capitalists or banks or appearing before the "sharks" on that T.V. show. It means trying to persuade rich people that they can get even richer by investing in or loaning money to one's proposed business. This too can be a restrictive or cumbersome process. 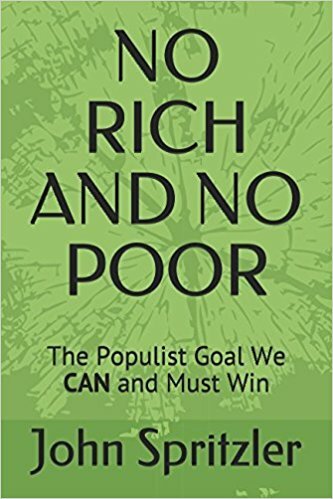 Even worse is the fact that instead of having to persuade people that one's proposed enterprise will be good for ordinary people (as in egalitarianism), one must persuade rich people that it will make them even richer. Economic decison making as described above, which applies to both entrepreneurial and well-established enterprises, involves a huge number of people--possessing an enormous amount of information collectively---contributing directly or indirectly to the decision whether to give an economic project a green light. The knowledge of the entrepreneurs is made use of far more than in a centrally planned economy that is hostile to creative ideas arising outside the central planning body. Additionally, the knowledge and opinions of every person in any way affected by the decision to give or not give a green light to the project is tapped in one way or another because the actual economic decisions are always made with great consideration paid to not damaging one's reputation in the eyes of all others affected by the decision. Furthermore, the criteria for a good reputation are the right criteria--the things that egalitarians (the only ones who can be members of a local community assembly) care about most, whereas the criterion of profit is a deeply flawed one. This means that the information gathered from large numbers of people for economic decision-making is not only vast in quantity but better in quality than the information incorporated into mere price in the market place. The sharing economy based on reputation for decision-making is thus both superior to a centrally planned economy and a market place capitalist economy based on profit. A reputation-based sharing economy will certainly not be perfect. Perfection is an impossible goal. There is not, and never could be, a profit-based capitalist society in which every worker worked 100% efficiently and every business derived the maximum conceivable profit that the laws permit. Look closely anywhere today and one will find what, from the point of view of profitability, is inefficiency. From the point of view of human happiness and decency, however, what a capitalist calls inefficiency might often better be called reasonableness. Basing economic decisions on reputation (for reasonableness) is, arguably, the best way for reasonable people to make society reasonably good, which is to say a whole lot better than our present capitalist society. When a person in an egalitarian sharing economy goes into a "store" to obtain some commodity (or service), what actually happens, given that money is not used at all. To read about this, click here. How do suppliers of proverbial "widgets" in an egalitarian sharing economy know how many widgets to produce? Typically, this question takes the form of whether they should produce more or produce less than the current amount being produced. The people who need or want the widgets are just as capable of communicating whether there are too few or too many widgets in an egalitarian sharing economy as they are of communicating this in a capitalist profit-driven economy. Human ingenuity in such matters is amazing. There is no reason to believe that in an egalitarian sharing economy widgets will either start piling up in unwanted piles for a long time, or that people will suffer widget deprivation for a long time. Things analogous to today's "on time delivery" would be perfectly possible in an egalitarian sharing economy. The purpose of the voluntary federation system, with its assemblies and delegates, is to address these problems by crafting proposals for mutual agreement. The culture of egalitarianism (mutual aid instead of competition to see who will be a winner and who a loser) makes such solutions desirable for everybody and hence very likely to be implemented. * Here, in the context of who can participate in a local assembly, the phrase "in the community" means residing in the community or, in the case of a person who resides outside the community, working reasonably in an enterprise located in the community. ** Local assemblies can, however, cooperate to defend people who are attacked by anti-egalitarians. If, for example, people somewhere decided (democratically or not) to enslave others, then local assemblies of egalitarians would have every right to form a militia and forcibly prevent them from enslaving anybody. From the point of view of the would be slave owners, they would essentially be ordered by a "central government" (i.e., an authoritarian, top-down commanding government) to cease enslaving people. It is the egalitarians, not anti-egalitarians, who should enjoy the absence of such an authoritarian law-making central government.